I don’t consider my self a very political person but in the light of upcoming elections both in the US and in Canada where I live, I remembered a book sitting on my self I read a while back. What I love about the book is that it doesn’t promote any particular party but speaks about what both parties (although this is a US book, Canadians have their own versions of Republicans and Democrats with a few bonus parties thrown in there) need to consider. Of particular interest to me is the fact that traditionally, Christians have focused their energies around a few key issues and forgotten that Jesus spoke very little about what are being aspoused as “family values”. 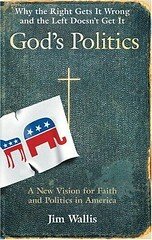 Not that these hot button issues aren’t important but the book paints a broader picture around God’s Politics. In Canada, you have about 3 weeks and in the US, you have about 7 to read the book. Go ahead, I’d love to hear your take.